Employees contributed their time and talent for a community cause that matters. inMotionNow (www.inmotionnow.com), a leading provider of work management solutions for marketing and creative departments, has secured $6,407 in charitable donations to benefit Duke Children’s and its patients, many of whom were raised in the local community. Duke Children’s treats over 60,000 unique patients each year, and over 90% of those patients are from North Carolina. The hospital is firmly grounded in four missions: clinical care, laboratory research, medical education, and children’s health advocacy. It acts on each of these missions with the help of the generous individuals and organizations that support it each year. Thanks to their contributions and the amazing men and women who devote their time and energy to the hospital full time, Duke Children’s has been able to accomplish major medical breakthroughs and deliver remarkable care to patients. The hospital was the world’s first to use insulin pumps for infants and toddlers, now considered a standard of care. It’s also one of the largest pediatric bone marrow transplant programs in the world, and a leader in the treatment of children born to HIV-infected mothers. 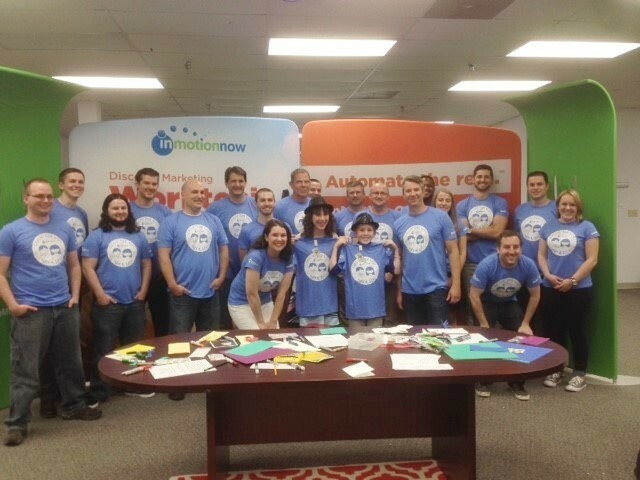 As part of Duke Children’s May 2016 outreach, inMotionNow employees volunteered their time to help the hospital drum up support in the form of pledged funds. The two-day event consisted of a tour of the hospital and a day of volunteerism, during which inMotionNow employees made phone calls to previous Duke Children’s donors whose gifts were ready to be renewed; wrote “get well soon” cards to patients at the hospital, and promoted the fundraising link through their personal social channels. inMotionNow also agreed to match 10% of all donations. inMotionNow first connected with Duke Children’s through one of their clients, Children’s Miracle Network Hospitals (CMN Hospitals), who uses inMotion to proof web design and digital assets. CMN Hospitals is a network of 170 hospitals across the U.S., Canada, and Puerto Rico. The network’s mission is to raise awareness and funds for local member children’s hospitals. All money raised through CMN Hospitals stays local, benefiting the hospital in the community it was raised. Duke Children’s is the local Children’s Miracle Network Hospital for the triad, triangle, and Wilmington areas of North Carolina. inMotionNow is a leading provider of creative production management solutions, facilitating efficiency and productivity from project kickoff to final approval. inMotion, the company’s flagship SaaS product, delivers measurable value to creative and marketing teams by simplifying every phase of the creative production process. Project stakeholders can manage, track, and collaboratively review their print, video, and interactive projects in a centralized, online environment. With a user-friendly interface and dedicated customer success team, inMotion helps creative and marketing teams of every variety automate their workflow and do the work they love. A nationally ranked pediatrics program and international referral center, Duke Children’s is respected for delivering the most advanced, comprehensive care available. Duke Children’s is committed to providing hope and answers to families when they need it most. Families can access services in Durham, North Carolina, and through an extensive network of more than 23 primary and specialty care locations across the state. Duke Children’s singular focus to improve children’s health has led to remarkable achievements, redefining what it means to provide the best possible care. Because Duke Children’s is part of an academic medical center that is ranked among the nation’s best, patients benefit from the latest treatments, research, technology, and medical advances, many of which were pioneered by Duke physicians and scientists.